John Steinbreder is an award-winning senior writer for Golfweek magazine, Contributing Editor to MetGolfer, and the author of six books. PART I: you've Got to Play by the Rules. Chapter 1: We Didn't Make the Rules. Chapter 2: It's Not Just a Game (Why Golfers Are So Devoted to Golf). Chapter 3: The Rules (And I'm Not Talking about Dating). PART II: The Unwritten Rules: How to Handle yourself on (And off) the Course. Chapter 4: Universal Truths and Other Rules to Live By. Chapter 5: This Isn't Caddyshack: Playing on Public and Private Courses. Chapter 6: Driving Ranges, Putting Greens, and Other Practice Facilities. Chapter 7: Taking Care of Business. Chapter 8: The Do's and Don'ts of Golf Outings. Chapter 9: Keeping Your Cool on the Course: Fan Etiquette. Chapter 10: The Ten Most Devastating Penalties. Chapter 11: The Ten Best Games and Bets to Make in Golf. 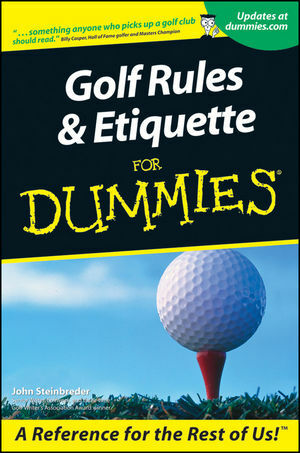 Chapter 12: Ten Things You Can Learn about Golf Rules and Etiquette from the Movies.